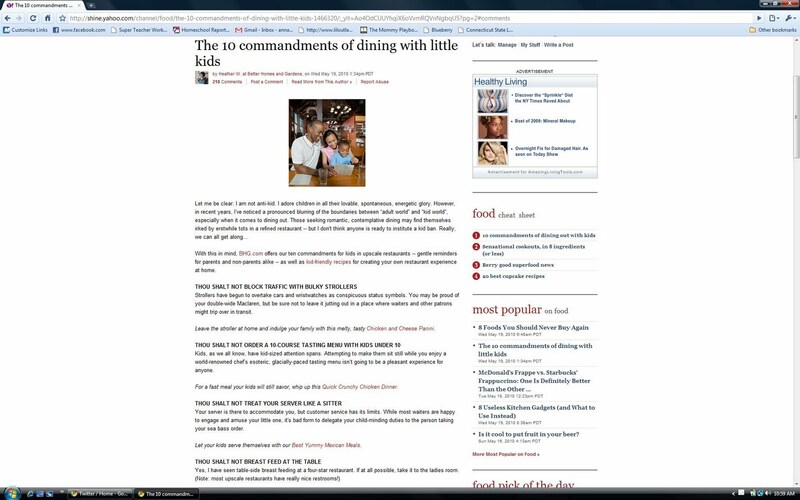 A friend of mine tweeted this article with the 10 Commandments Of Dining with Little Kids (By Heather W. at Better Homes and Gardens), to me yesterday. I was so fired up when I came across "commandment" #4, I could have just torn the author apart. 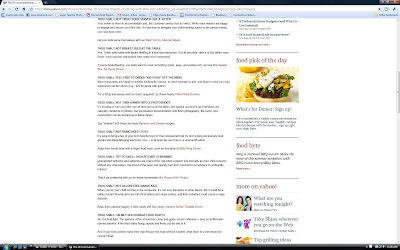 So here I am, sharing the article and venting my disgust. Strollers have begun to overtake cars and wristwatches as conspicuous status symbols. You may be proud of your double-wide Maclaren, but be sure not to leave it jutting out in a place where waiters and other patrons might trip over in transit. Kids, as we all know, have kid-sized attention spans. Attempting to make them sit still while you enjoy a world-renowned chef’s esoteric, glacially-paced tasting menu isn’t going to be a pleasant experience for anyone. Your server is there to accommodate you, but customer service has its limits. While most waiters are happy to engage and amuse your little one, it's bad form to delegate your child-minding duties to the person taking your sea bass order. It’s exciting to see your little one all dressed up at the table, and special occasions and birthdays are naturally conducive to photos, but overzealous documentation with flash photography, flip-cams, and camcorders can be distracting to fellow diners. It’s wise to bring a few of your kid’s favorite toys for their amusement but try not to bring excessively loud games and bleep-blooping electronic toys -- or at least be sure there’s a volume-off button. Unexpected tantrums and outbursts are a fact of life, but when a parent sits stoically as their child screams without any intervention, the mood of the room can quickly turn from convivial to incredulous to profoundly irritated. When you let your child run free in the restaurant, it’s not only disruptive to other diners, but it could be a safety hazard: Restaurants are full of hot plates and sharp cutlery, and kids underfoot could cause a major disaster. Ah, the food fight. The epitome of fun at summer camp and grade school cafeterias -- less so at Michelin-starred eateries. If the food starts flying, quietly and firmly put an end to it. Breastfeed in the RESTROOM? Are you kidding me??? Hey, Heather W. at Better Homes and Gardens, quit being an ignorant, insensitive douche. Do you know what breastfeeding is? It's EATING. Would you like to go sit on the toilet in the restroom and eat your meal? I don't give a flip how clean the restroom may appear, it is still loaded with dangerous bacteria on all surfaces. Never mind the fact that breastfeeding in a restroom is uncomfortable for the mother for several reasons, it's exposing the baby, who has an immature immune system to even more harmful bacteria than it's already been exposed to just being out in public. Why are people so horrified by breastfeeding??? It's natural, it's healthy, it's not dirty, it's not gross... I just don't get it. This country is so oversexualized that the simple act of naturally feeding your baby is offensive to so many people. In other countries people don't even bat an eyelash at the sight of a woman breastfeeding. Breastfeeding is the best option for babies when it's possible for the mother to do it, so why make breastfeeding mothers so uncomfortable? Why turn it into something shameful or dirty? Why turn it into something to hide? Breastfeeding has so many health benefits for the child, both long and short term. Breastfeeding has shown to improve IQ and reduce illnesses. It has even shown to reduce the risk of obesity as they grow older! Obesity is an epidemic in America and breastfeeding could possibly help with that! 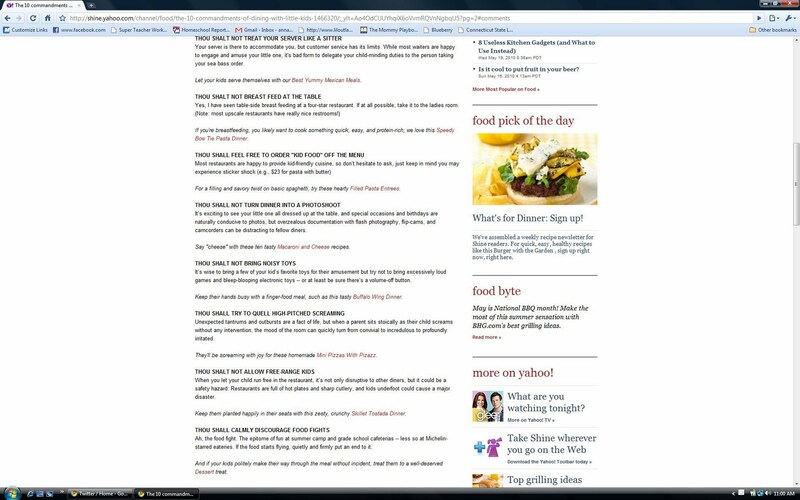 I think perhaps the author of the article may have some self image issues she needs to deal with. Now that I have that out of the way... 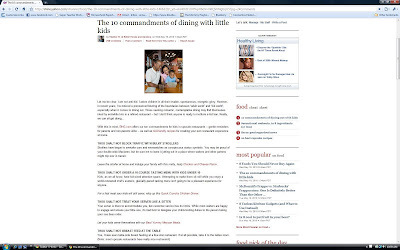 The rest I do agree with to some degree (well for the most part, the author obviously isn't a fan of children in restaurants at all, despite what she said and the whole article was done in poor taste). I have 5 children and we have peaceful meals at restaurants regularly. We aren't going to 4 and 5 star restaurants, but we're going to nice sit down establishments, NOT McDonalds. My children know how they are expected to behave in public and they do it. They would not even think to run around, throw food, yell (or even speak loudly for that matter) or otherwise misbehave. They just know better and I'm not speaking about older children here, I'm speaking about young children and toddlers. We are complimented on their behavior every single time we go anywhere with them at all. Even with having 5 children of my own, I can not stand to be around families with unruly children when we're trying to eat or even shop for that matter. Pretty much everywhere we go, around here especially, there are children running wild throguh stores, bumping into people etc. This is not just "how children behave", this is parents not taking responsibility and teaching their children how to act appropriately in public. So with that, all of you breastfeeding mothers out there, be proud of what you're doing for your children. Don't let anyone shame you or make you feel uncomfortable for feeding your child. Don't feel as if you have to hide in a restroom while feeding your child as to not offend people. We have the right to feed our children where we are comfortable and our children have the right to eat when they are hungry. We are not in the wrong here. Heather W. at Better Homes and Gardens, I think you would probably be better off, as a person with no children, NOT giving advice on how to parent. I need a like button! At least I have Screenshots to add! What do they think editing it will make what they said go away? Again, we are so sorry for posting this and that you were offended. Took some pictures on this lazy Saturday!